End of road PRIVACY, NO RESTRICTIONS & INCREDIBLE 180-degree VIEWS from this 4100+ sq ft Hill Country stone home. Lg covered front entry. 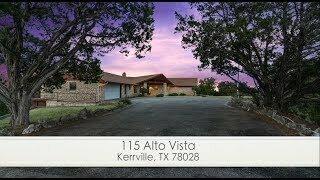 Open-truss living w/ high ceilings, stone fireplace & large windows overlooking Kerrville & beyond. Step out to the wrap-around observation-style deck to enjoy peace, tranquility and of course the views! Island kitchen w/ tons of cabinet & counter space w/ space for upright freezer. Breakfast area, formal dining, office (could be 4th bedrm), den & enclosed porch. Dual master suites - one up, one down. Rare opportunity - this home is ready to make your own.